Researchers at Weill Cornell Medicine and Baylor College of Medicine have shown that consuming even a modest amount of high-fructose corn syrup (HFCS)—the primary sweetener in sugar-sweetened beverages (SSBs)—promotes the growth of intestinal tumors in mouse models, independently to any link with obesity and metabolic syndrome. The studies, headed by Jihye Yun, PhD, assistant professor of molecular and human genetics at Baylor, also identified the mechanism by which fructose can fuel cancer growth, a finding that could feasibly lead to new therapeutic strategies. Yun is co-corresponding author of the researchers’ published paper in Science. Increasing consumption of SSBs has been paralleled by a global “epidemic” of obesity, and also by an increase in the rate of colorectal (CRC) incidence among young and middle-aged adults, “suggesting a potential link between SSBs, obesity, and CRC development,” the authors wrote. Studies have indicated that excessive consumption of SSBs causes obesity, and that obese men in particular are at an increased risk of CRC. However, it’s not clear whether SSBs contribute directly to tumor formation. “Two important confounders are obesity and metabolic syndrome, which can indirectly affect tumor development by changing a myriad of physiologic and endocrine systems in multiple organs,” the team pointed out. To determine the physiological effects of ad lib HFCS consumption the researchers gave APC-deficient mice and normal control (Con) mice free access to water that was sweetened with 25% HFCS, which is composed of both glucose and fructose in a 45:55 ratio. Both APC-deficient and control animals with ad lib access to HFCS became obese within two months, and the control mice also developed metabolic syndrome. The researchers then syringe-fed another group of APC-deleted mice with a daily amount of the HFCS-sweetened water that was equivalent to a human drinking just one can of sweetened soda per day. “This modest amount of HFCS (~3% of total daily caloric intake) is calorically equivalent to human consumption of less than 12 ounces of SSB (~20 g of HFCS) per day,” the researchers wrote. Yun said the findings point to an independent relationship between HFCS and tumor progression. “These results suggest that when the animals have early stage of tumors in the intestines—which can occur in many young adult humans by chance and without notice—consuming even modest amounts of high-fructose corn syrup in liquid form can boost tumor growth and progression independently of obesity.” This observation might also explain why increased consumption of sweet drinks and other foods with high sugar content during the past 30 years is correlating with an increase in colorectal cancers in 25- to 50-year-olds in the United States, Cantley further noted. Interestingly, while glucose and fructose have the same calorific value and similar structures, they are metabolized differently, the scientists stated. 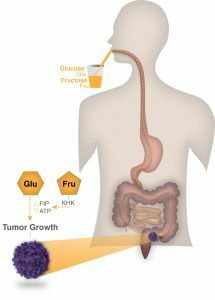 Using techniques including radiolabelling to trace the fate of glucose and fructose in the APC-deficient mouse model, they found fructose was being converted to fructose-1 phosphate in the mouse tumors. This altered tumor cell metabolism and generated fatty acids, which supported tumor growth.